…and it’s been almost exactly the same since the beginning of March. We’re well into Summer now, and it’s HOT! Today was around 35 degrees, with no wind and humidity around 12%. Baking, dry heat… and everyone tells me that Bangalore is a pleasant climate compared to most of India, so I guess I should think myself lucky! The night-time temperature now is pretty much the same as the daytime summer high in Edinburgh. I’m not sleeping so well in the heat, and usually get up by 7am at the latest anyway because the traffic noise makes it impossible to sleep in. I’ll have to work harder at going to bed earlier. It’s the equinox tomorrow, and the sun will rise and set here at around 6.30am/6.30pm. But this hardly changes by more than 30 minutes throughout the year. That’s definitely one thing I’m missing from being further North — for me the solstices and the equinoxes have always been important touch-stones in the year, helping to mark out the seasons and keep me connected with the rhythms and cycles of nature. But here everything is very different and I feel like I’m having to learn about some aspects of nature all over again, which is quite odd. Gardening is a challenge because it seems you can pretty much plant some stuff any time you like, plus I’m not entirely sure how to look after some of my plants in this searing dry heat. 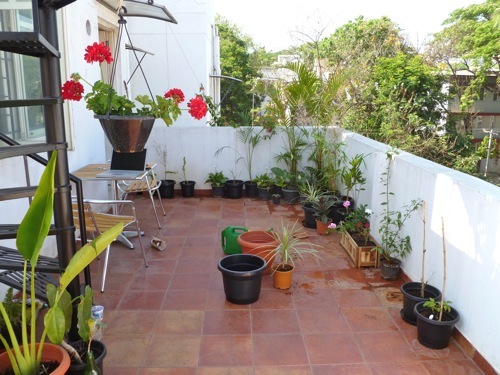 Here’s yet another picture of my balcony (my flickr stream is full of them!). I’m trying to build up a small garden as fast as I can — this was totally empty when I moved in a month ago, but I’ve been buying and foraging plants and sowing seeds like crazy. I love spending time out here, but it’s a real pity that it goes dark so early… the earliest I can get home from work is around 6.15pm if I grab an auto as soon as I leave, so I can sit outside for about half an hour at dusk but then inevitably have to move inside because I’m getting bitten by mosquitoes. I do manage to sit out here to eat my breakfast every morning though, and morning is often lovely and cool, or at least as cool as it gets, so I guess I need to re-train myself to be a morning person. I’ve been here for 3 months now, and it really has flown by… next week is the last week of my first term of teaching already. I’m hoping to get away somewhere for a couple of days’ holiday, but we only have a week of “term break” before the next term starts. Plus after three months I’m feeling like it’s time to start doing some other stuff apart from working and a bit of gardening at the weekend. It’s time to move onto the next page, but I’m not really sure what that might entail. Perhaps joining some evening classes or a gym might be a good idea. I’m missing friends from back home a lot just now. But I went to a Holi party with colleagues from work yesterday and that was a lot of fun… see the pics on flickr. heh thanks! :) Ice cream and cold beer are definitely coming in useful, for medicinal purposes… :) Ice-cold cans of imported Schweppes bitter lemon are my secret weapon, but taking a shower helps too when I’m at home. I guess the main thing for a European is to learn not to just charge about all the time. I force myself to walk more slowly, or take an auto even when I want to walk if it’s hot. Just a matter of learning how to cope with things being different I guess. I enjoyed reading that. The garden looks good, keep it up, mate. Get a hammock! Having an outdoor space is so important. And using it. The weather in Kenya was mostly more tollerable than you’re describing, but I noticed I had really changed by my second year out there so that I was better able to deal with it. Mist your plants with just water twice a day, during the summer. It should make a big difference. Thanks Jeanne, that sounds like good advice — I think keeping the humidity up will be crucial for the palms. 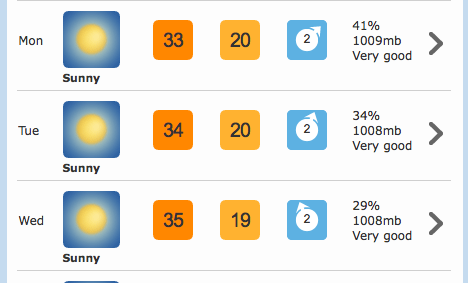 I’ve probably been over-watering a bit in this heat too, so misting sounds ideal.